Spring is HERE! However the weather is not totally in agreement. (LOL at the insane amount of snow New York got this morning). You’d think spring weather in LA calls for mini linen dresses sandals but no, we LA folk stay covered up until temps reach at least 80 degrees (anything below that might as well be the arctic circle). A common staple for this sunny but not yet hot weather is a pair of jeans and a t-shirt. Boring but essential. A few weeks ago after the rain stopped and the sun came out I was dying to get out of the house so I texted a friend to meet up for lunch. 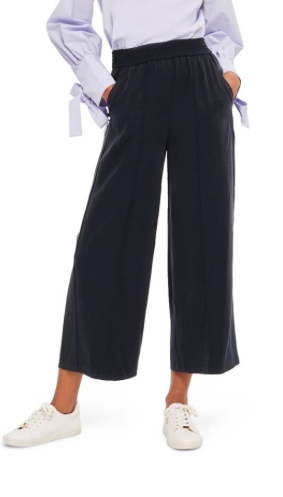 As I was getting ready for the day I thought, “Why not shake things up a bit?” Instead of going for my usual jeans I reached for these navy blue, high waisted, wide leg pants from Zara (similar here). I’ve never bothered wearing pants like this because as a girl who stands at a whooping 5’2 I’m constantly trying to avoid clothing that makes me appear shorter than I already am. But to my pleasant surprise, these trousers fit so well and even elongated my legs. I also wore a simple white t-shirt to keep my look casual, and let me tell you, this is literally the most comfortable outfit you could pull off. So I’m now completely converted into a wide leg trousers kind of girl. I am also convinced this is the one pant every girl needs in their closet this spring (perfect spring to summer transition piece). This style pant is ten times more interesting than your standard jeans, not to mention they are easy to wear and insanely comfortable. I swear it feels like your in your pajamas the whole day. Stock up for spring by clicking the images below to shop the wide leg pants you need in your life, like yesterday.